Hello friend! I hope you’ve been having a beautiful week. I’m not feeling as verbose as normal so today’s post is going to be short and sweet and full of deliciousness. I’ve been pretty busy lately and have had a desire for some comfort in the form of cookies, but I find most recipes are a bit too high in sweetener or starches for my sensitive little blood sugar. Enter this magical cookie jam packed with chewy goodness, healthy fats, and tons of beneficial fibre thanks to our secret ingredient, avocado! Avocados are rich in carotenoids, a family of phytonutrients that help promote healthy skin and function as powerful antioxidants in the body. One of the major players is beta carotene, which gets converted to vitamin A more readily in the presence of the magnificent avocado. Vitamin A is crucial for healthy skin, nails, and immune function. This humble fruit also contains oleic acid, which is most commonly found in olive oil and is related to increased heart health. One study demonstrated that adding one avocado a day to your diet improved blood lipid (fat) profiles, an important predictor of heart disease. Finally, avocados can be great for blood pressure and fluid balance in the body thanks to their high levels of potassium. 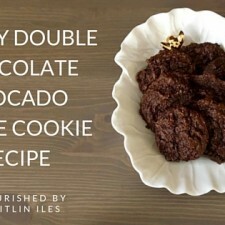 In addition to all these stellar benefits from the avocado, you can also feel good indulging because these cookies are grain free and can be made deliciously vegan if you’re rolling the plant-based lifestyle. So bake on friend, I’ve got you covered! This recipe combines healthy fats from avocado, fibre from coconut flour, & raw cacao to make an antioxidant rich, super decadent dessert that won't leave you feeling hangry or bloated. Preheat oven to 350F and line a large baking sheet with parchment paper or coconut oil. In a large mixing bowl whip together wet ingredients until fully combined. I used a small food processor and found it worked perfectly! In a separate bowl whisk together all dry ingredients except chocolate chips. Using a large spoon drop dollops of dough onto pan and pat into small rounds. Bake for 7 minutes, then rotate and bake another 7-10 minutes until edges are firm and middle is still slightly soft to the touch. Well friend that’s our delightfully decadent, chewy, gooey recipe for this week. If you need any extra support on your healing journey, make sure you download my FREE Stop Self-Sabotage Workbook right here. Have a beautiful day friend! 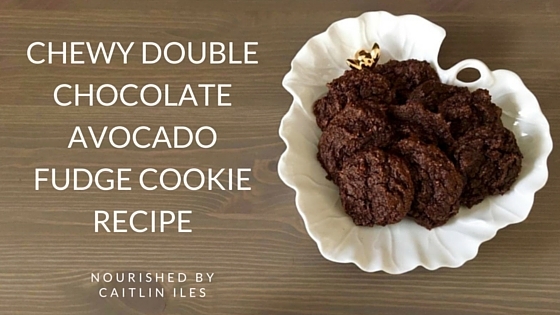 They couldn’t have given those chewy double avocado fudge cookies any better of a name! Although you’d never know they contain avocados! They are extremely tasty and very likeable! And I tried them on some pretty crazy cookie connoisseurs! Easy, tasty and healthy to boot! Doesn’t get much better than that!